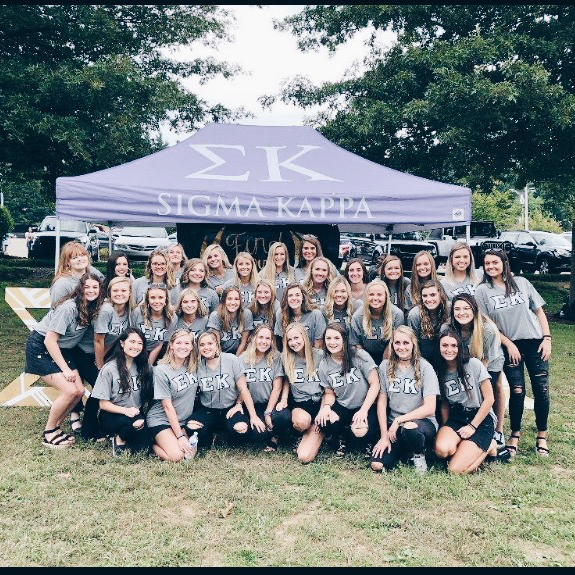 The Theta Alpha Chapter of Sigma Kappa was established at Appalachian State University in 1985. Throughout the years, the Theta Alpha Chapter has grown, not only in size, but also in traditions. New member class sizes have tripled in size since 2007. And, as a chapter, we continually strive to push our members to grow as students and women. Over the years, the chapter’s GPA has risen accordingly. The Theta Alpha Chapter has held numerous philanthropic events, both traditional and new, that reach all five philanthropies: the Sigma Kappa Foundation, Inherit the Earth, Gerontology, Maine Seacoast Mission and the Alzheimer's Association. These events include the Weenie Roast, Elephant Gala and Scholarship Banquets in the fall semester, and Senior Prom, Adopt-a-Street events and our Chacos and Tacos Fundraiser that take place in the spring semester every year. Additionally, the Theta Alpha Chapter has been awarded Appalachian State's Sorority of the Year numerous times, most recently being in 2017. The Theta Alpha Chapter has created lifelong friendships, while also benefiting the Boone community by living out our four values of service, friendship, loyalty and personal growth.